Armed with some instructions for where to find a few different seagrass species and a couple of names to ask for, I headed to the Smithsonian Marine Station (SMS) in Fort Pierce, FL on Thursday, April 17th. The SMS was kind of deserted, but there was a behind the scenes tour scheduled for 2pm, so I waited around for that. In the meantime, I went to meet with Bill Hoffman, the Exhibit Manager at the St. Lucie County Aquarium, across the street from the SMS. He shared with me his experience with setting seagrasses up in his aquarium there. He said that at first, he would try to lay a patch of seagrass, with surrounding sediment into the tanks (like sod,) but that they kept dying. Eventually, he had success when he planted the plants into the tanks that contained the dead “sod.” But still, not every species he tried will grow in the tanks. Bill loaned me some snorkeling gear so that I could go hunt down the seagrass beds that Robert Virnstein described to me. My only experience of seagrass is the Zostera marina at Bodega Bay, so I was interested in laying eyes on some other species. I found the dense Syringodium bed next to the boat ramp at the end of the Aquarium’s parking lot. It was remarkable to me how variable the density of both the seagrass as well as the algae were over a really small area. Sometime, the algae was so abundant and dense that I couldn’t even see the seagrasses. Other times, it was easy to see individual seagrass shoots poking out in the sandy sediment. Syringodium has cylindrical leaves, so that was different. 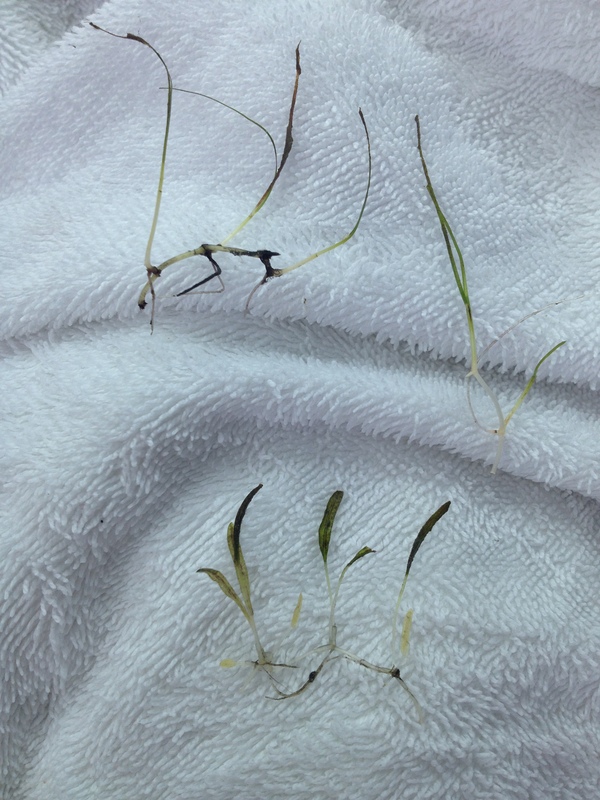 The leaves were only about 8 inches long, and the rhizomes were very delicate compared to Z. marina. Then, I went over to Chuck’s Steak House. There, I found a mixed bed with two kinds; I think Halophila and Halodule. They were about the same size, but their leaves were shaped differently. These were remarkably tiny! I will definitely have to re-write the sampling protocol for these. After my little snorkeling adventure, I went to the SMS “Behind the Scenes” tour. I learned a lot about the Indian River Lagoon, which has significant temperature and salinity gradients, making it an incredibly biodiverse ecosystem. The tour was useful and interesting. Especially, the Mangrove experiments – couldn’t help but wonder about the phylosphere microbial communities on these salty leaves. 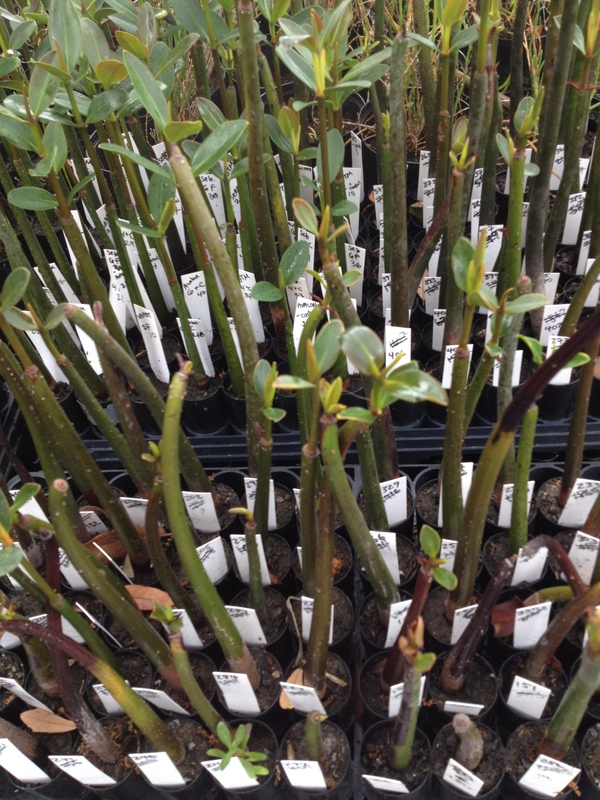 Baby Mangroves! Some deal with salt by excreting it from the leaf surface, others have specialized salt excretion nodules at the base of the leaves. Eventually, I connected with Niclas Engene, who is interested in collaborating with us on a GoLife proposal to do Cyanobacterial genome sequencing/phylogenetics. I also chatted with a few people, including Jenny Sneed about which would be the best primers to use for algal diversity surveys. No one seemed to know, but at least I’m not alone in my uncertainty. I gather that the person I really needed to talk to is Justin Campbell, but he was probably on a plane coming back from Belize while I was there. Oh well.